A gorgeous compound located inside the prestigious La Punta Estates, Villa Lunada is less than one mile from the St. Regis Punta Mita Hotel. With 5,500 square feet of space, there’s plenty of room to roam, so whether it’s a guy’s surf vacation or a get away with friends and family, your style won’t be cramped. 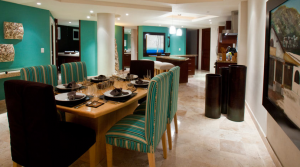 Ventana Del Mar is a spacious four bedroom, four bathroom luxury penthouse condominium adjacent to the Four Season’s Punta de Mita, Mexico, property. Sitting atop the sea bluff overlooking the Bay of Banderas. This vacation rental has more than enough space for two families with two master bedroom suites and two rooms with twin beds, all connected with a centrally combined kitchen, living and dining room spread. 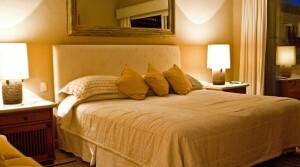 Hotel Cinco’s Signature one king-sized bedroom, one bathroom condominium sleeps 2 guests. Be welcomed as a part of the Cinco family from the moment you arrive and enjoy stunning beachfront views. With access to more than fifteen restaurants, world-class surfing and SUP, walk out the door and into the sand, surf and sun. 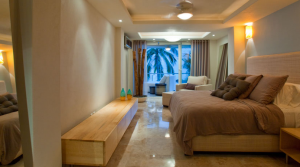 Hotel Cinco’s Signature two bedroom, two bathroom condominium sleeps up to 4 guests. Be welcomed as a part of the Cinco family from the moment you arrive and enjoy stunning beachfront views. With access to more than fifteen restaurants, world-class surfing and SUP, walk out the door and into the sand, surf and sun. 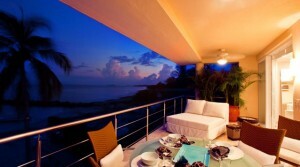 Hotel Cinco’s Signature three bedroom, three and half bathroom condominium sleeps 6-7 guests. Be welcomed as a part of the Cinco family from the moment you arrive and enjoy stunning beachfront views. With access to more than fifteen restaurants, world-class surfing and SUP, walk out the door and into the sand, surf and sun. 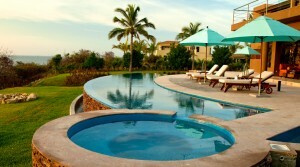 The luxury four bedroom, four bathroom Penthouse overlooking the surf breaks of Punta Mita, Mexico, is a private get away for a romantic duo, or the whole family. 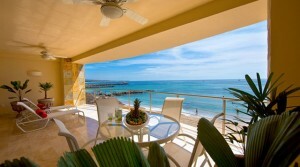 Complete with two master suites, two bedrooms, and large doors that open to a covered patio overlooking the Bay of Banderas, the location is perfect for surfing yet safe enough for kids’ beach swimming. A one-bedroom suite with over 1,400 square feet of luxury accommodations, and a king-sized bed overlooking the terrace with an ocean view. Each unit can sleep a maximum of four persons and has a separate powder room. A two-bedroom suite with over 1,400 square feet of luxury accommodations, and a king-sized bed in the master overlooking the terrace with an ocean view. Each unit can sleep a maximum of four persons and has a separate powder room.